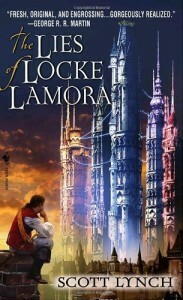 “The Lies of Locke Lamora” is the alliteratively-titled debut novel by American fantasy author Scott Lynch. The novel quickly attracted a lot of praise (and occasional criticism), most of which was justified. The story is set in the city of Camorr, a wealthy city-state in a fairly typical late-medieval/Renaissance era Fantasy setting. The city is dominated by two groups – on one side is the nobility and on the other the city’s underworld lead by Capa Barsavi, master of all the thieves and criminals in the city. The two groups get along fairly well together, their interactions conducted according to the “Secret Peace” agreed between them. According to the terms of the Secret Peace the City Watch stays out of the areas controlled by Barsavi and doesn’t arrest his employees, in return stealing from the nobility is strictly banned. The hero of the story, Locke Lamora, is, as far as Barsavi and his fellow thieves know, just the leader of a small-time gang of confidence tricksters who make their living extorting some of the more foolish residents of Camorr by posing as poor priests and begging for money. What they don’t realise is that Locke’s deceptions go far beyond simple confidence tricks, instead Locke and his friends (who call themselves the “Gentleman Bastards”) target the nobility, attempting to ensnare noblemen with more money than common sense in elaborate schemes to part them from their money. Since preying on the nobility is explicitly forbidden by the Secret Peace – a prohibition brutally enforced by Barsavi – Locke has to deceive both his fellow thieves and the nobles in order to stay alive. The novel opens with Locke and his gang starting their biggest scheme yet – to trick the wealthy Don Salvara into investing in a fictional military scheme to help a group of foreign merchants protect their priceless vineyards. Unfortunately for Locke, Camorr’s underworld is in increasing turmoil as Barsavi and his allies come under attack from the mysterious and murderous ‘Grey King’. Before long, Locke and his friends unwillingly become sucked into the Grey King’s plots as the Grey King seeks to use him as a pawn in his plan to take control of Camorr. Meanwhile, Locke also comes to the attention of the Spider, the mysterious head of the Midnighters, the Duke of Camorr’s covert intelligence agents. Along with the main plot there are also frequent flashback interludes to how Locke went from being a child thief on the streets to his current situation, the flashbacks offer more insight onto Locke’s character and do end up having some consequences for later developments in the plot. The Lies of Locke Lamora is not a groundbreaking book. The setting is a fairly typical fantasy city reminiscent of other fantasy cities such as Krondor or Viriconium and the plot, while a change from the usual epic save-the-world plot, is hardly revolutionary. The relative lack of ambition is actually one of the things that makes this such an entertaining book, it is refreshing to having a stand-alone fantasy novel that doesn’t have huge epic battles or a cast of thousands or a world-threatening battle between Good and Evil. The characters are interesting and well-developed, both the heroes and villains of the story, and Locke and his friends are likeable and charismatic. The dialogue is witty and well-written and the occasional exposition efficiently introduces the reader to Camorr while still being entertaining to read. The plots and subplots (both in the ‘present day’ and the flashbacks) are compelling almost from the start of the book, partly due to some cleverly-structured mini-cliffhangers, and partly due to Lynch’s willingness to throw in sudden plot twists and abruptly kill off characters. Lynch’s writing is remarkably assured for a debut novel, and it is a very entertaining read. There isn’t really much too criticise here. Some of the plot points occasionally don’t convince – for example Don Salvara and his wife are characterised as being intelligent enough that it seems a bit odd that they’re so easily taken in by Locke’s admittedly ingenious scheming. Also, too many of the Grey King’s schemes carelessly allow an escape route for Locke, although Locke does have to struggle hard to survive. Another small criticism is that while the early flashbacks do offer a useful and interesting insight into Locke and his friend Jean Tannen, some of the later flashbacks do offer exposition that is interesting but seems a bit unconnected to the main plot. However, these flaws are all minor enough that they don’t detract from the book. In summary, Lynch’s debut may not do anything revolutionary but it is an entertaining and well-written fantasy novel.